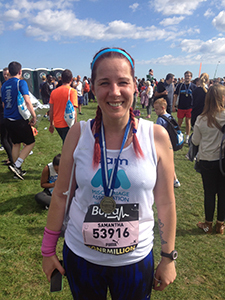 “I have always wanted to run The Great North Run and on my first time in the ballot was lucky enough to get a place. However I want to run it for a worthy charity and one that has helped me and so I’m raising money for The Miscarriage Association. Having lost all three of our babies through either ectopic pregnancy or missed miscarriage they have helped me and other people in the same situation get some help and support at what is a truly horrible and sad thing to go through. In fact the Liverpool Women’s hospital give our their advice leaflets and so is a resource used by our NHS.